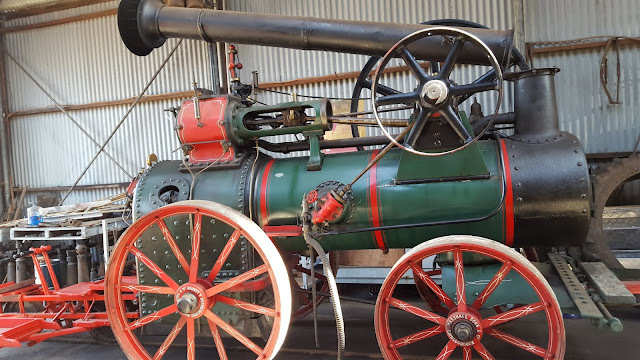 We had a brilliant day this week at the Don River Railway, in Don, Northern Tasmania. It was established in 1973 and trains began running three years later. The railway line which now exists runs from the Don Village through to Coles Beach, a distance of 14 km. 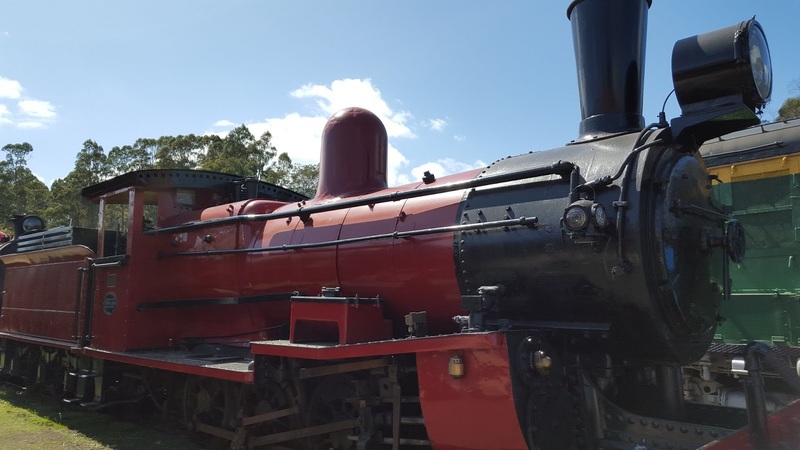 The many beautifully restored carriages and engines housed here at the railway station and yards are the results of thousands of hours of voluntary labour. We were stunned by the beauty and expert craftsmanship of the restorations. Both steam and diesel engines are available for use and today our old-fashioned carriages were drawn by a diesel engine. In 1927 the Duke and Duchess of York, who later became King George VI and Queen Elizabeth, arrived in Hobart and travelled around the state. 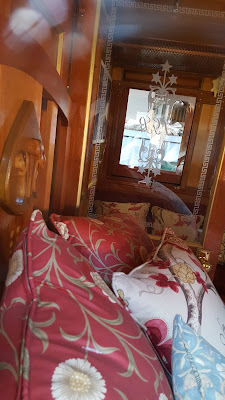 For part of their journey they travelled in a royal carriage which we were able to see today. 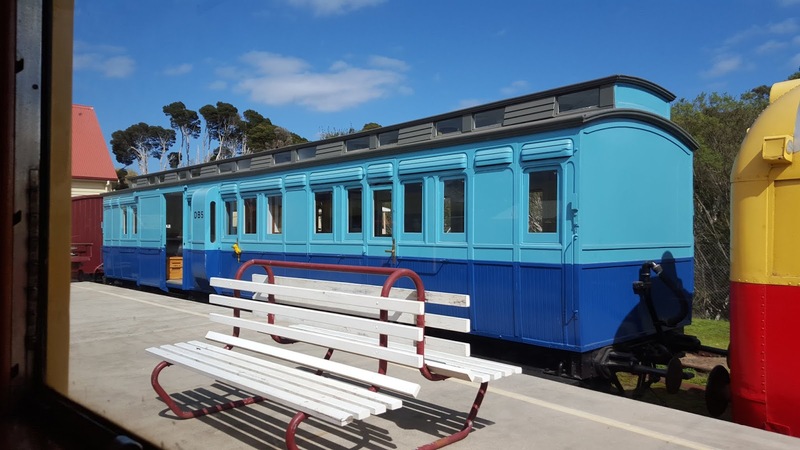 Restoration of this carriage began in 2009. The coach was also used by Edward Prince of Wales who later became king Edward VIII. The same carriage was also used by another son of King George and Queen Mary. 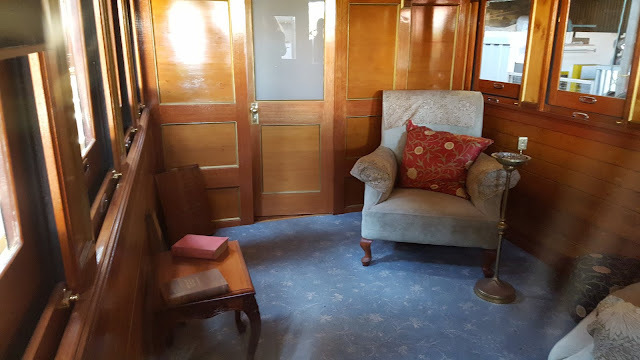 In 1934 Henry Duke of Gloucester travelled on this very coach to Launceston and further west through many towns until he reached Burnie where he re-boarded HMS Sussex. The beautiful oak bed had the Royal coat of arms engraved into the bedhead. Such details lovingly restored really mean a lot to me and show the integrity of the worksmanship and commitment to the project by the highly skilled volunteers who made it happen. Even down to the etched glass and soft furnishings! 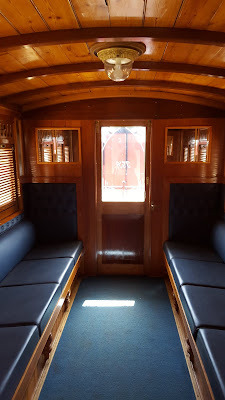 We travelled in a lovely old wooden carriage with the traditional Victorian baggage racks above and inner sprung seats which were extremely comfortable. More comfortable than the modern train seats I have to say! 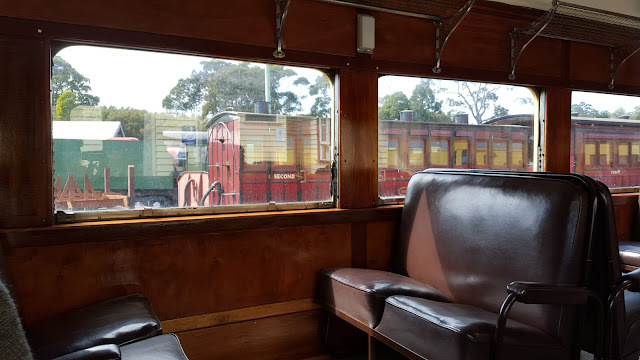 It was the perfect day to travel by train at a really slow pace and we were able to take in the scenery and really enjoy it, although it was a bit noisier than we're used to. With all the seats in groups of four facing each other it was a more spacious and fun way to travel. 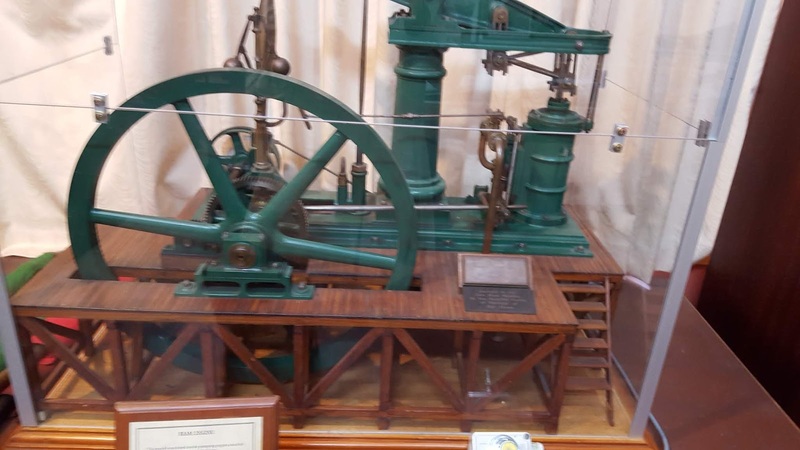 In the giftshop and museum there was lots to see and activities set up especially for children, where they can crank handles and see how things work. 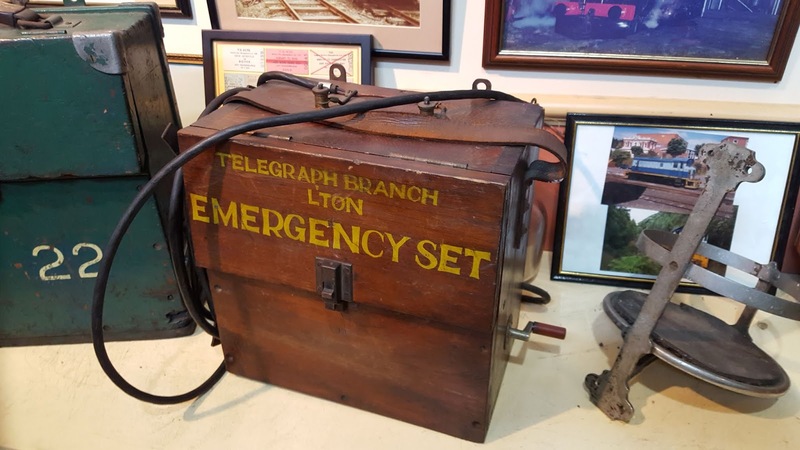 A full sized trolley carriage was also housed in the museum, along with many relics of the era such as emergency railway telephones and switchboards. Very interesting. I was blown away by the workshop! The size of it was astonishing. 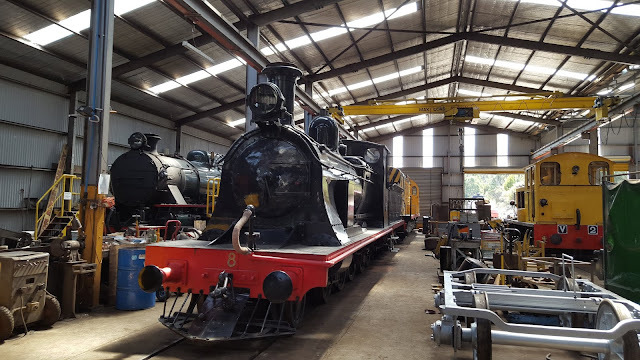 It houses many many carriages and engines, some of which have been fully restored and protected from the elements, alongside other engines which are being repaired and restored. There was even a massive ship's engine which they appear to be modifying for use in a steam train. The whole place was impeccably neat, clean and tidy. From the viewing platform we were able to look down over several of the engines in the working area. In the yard we were able to climb up into carriages and have a good look around. 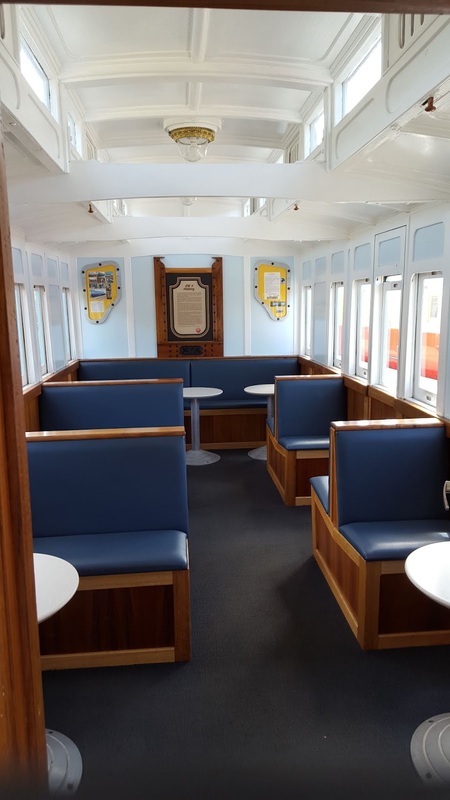 The colours and the materials used were just beautiful and sent us straight back to older times when people travelled by train and the only entertainment was reading, looking out the window or chatting to fellow passengers. How wonderful! 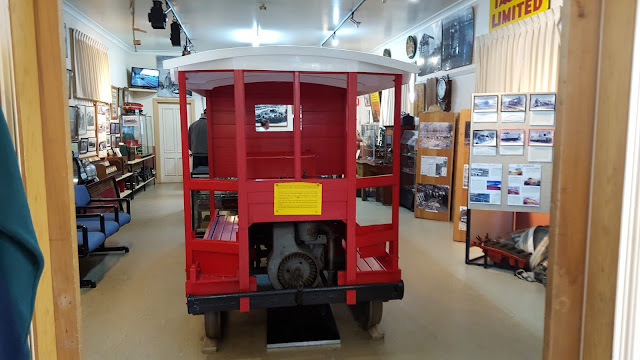 There were lots and lots of children of all ages riding in the train and roaming around the yard which was excellent to see. 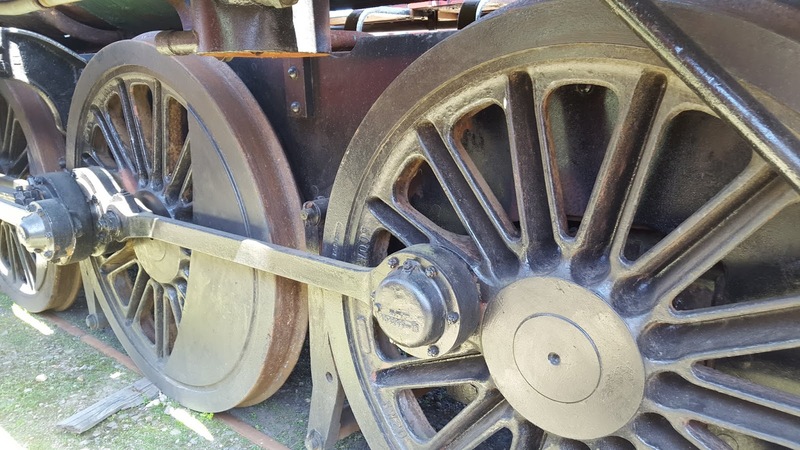 Don River Railway is a really fun outing for people of all ages. Back at home I have been collecting odd bits and pieces that turn up as we dig the soil and put up fence etc. So far I have an old cast iron oven door, parts of a winch and other things I can't yet identify. I'm planning to paint them all black and mount them somehow as a display to show a tiny bit of the history of our 100 year old farm. Stay tuned!